Dr. Greer has been involved in the highest levels of government and military for over 25 years. His family is well connected to space and aeronautics programs. 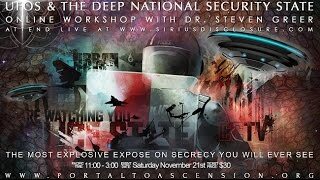 Here he shares what he has learned answering the who, what, where, and why of government secrecy, the deep trans-national security state, and the constellation of illegal (treasonous) projects that are currently under way. What is the future agenda for the cartel managing government secrecy -- and how do we need to prepare for this future? What is the planned Cosmic 911 deception, and what do we NEED to know? SOMEONE SMARTER THAN TESLA AND EINSTEIN! Dr. Greer: Amazing courage by the French!